Opinions of Iran remain largely unfavorable across much of the world, and in some predominantly Muslim countries, higher numbers express negative views of the Islamic Republic this year than in previous years. Majorities or pluralities in 17 of 23 countries express an unfavorable opinion of Iran, including most of those surveyed in Egypt, Jordan, and Lebanon, although Lebanese views are sharply divided along religious and sectarian lines. Iranian President Mahmoud Ahmadinejad continues to receive largely negative reviews in Muslim nations. Majorities in Turkey, Egypt, Jordan, Lebanon and the Palestinian territories lack confidence in him to do the right thing in world affairs. However, in Pakistan and Indonesia, opinions of Ahmadinejad are on balance positive. In most of the predominantly Muslim nations polled, there is considerable opposition to the acquisition of nuclear weapons by Iran, and concerns about Iran’s nuclear program have increased this year in Jordan and the Palestinian territories. 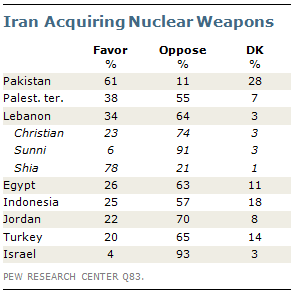 Only in Pakistan does a majority express support for Iran’s nuclear ambitions. Not surprisingly, Israelis overwhelmingly oppose a nuclear-armed Iran. Majorities in the United States and Western Europe express negative views of Iran, including more than three-in-four in Germany (86%), Spain (82%), and France (78%), and two-thirds in the U.S. (67%). A smaller majority in Britain (58%) shares this opinion. Views of Iran are more mixed across Eastern Europe. Russians, on balance, have a favorable view of Iran, while Ukrainians are evenly divided. Majorities express a negative opinion in Poland (56%) and Lithuania (65%). Roughly nine-in-ten Israelis (92%) have an unfavorable opinion of Iran, although among Israel’s minority Arab community, views are divided, with 45% expressing a positive and 44% a negative opinion. Iran receives mostly negative marks in four of the seven predominantly Muslim nations polled: Egypt, Jordan, Turkey and Lebanon. Opinions are evenly divided in the Palestinian territories, where roughly half (49%) have a favorable view of Iran, while the same percentage have a negative opinion. Pakistan (71%) and Indonesia (58%) are the only countries where majorities express favorable opinions of the Islamic Republic. Both Egyptians and Jordanians have become increasingly negative in their views of Iran over the last few years. A majority of Egyptians had a favorable view of Iran in 2006 (59%), but currently only 22% hold this view, down from 33% last year. A similar decline has taken place in Jordan. About half (49%) of Jordanians expressed a positive view of Iran in 2006, however just 23% now express this opinion. In Lebanon, roughly one-in-four Lebanese Christians (26%) have a positive view, while just 12% of Sunni Muslims assign a favorable rating to the largely Shia Islamic Republic. 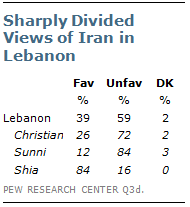 Lebanese Shia Muslims, however, voice overwhelmingly positive views of Iran – 84% have a favorable opinion. Majorities in five of the seven predominantly Muslim nations surveyed – Egypt, Jordan, Lebanon, Turkey and the Palestinian territories – express little or no confidence in Iranian President Mahmoud Ahmadinejad. 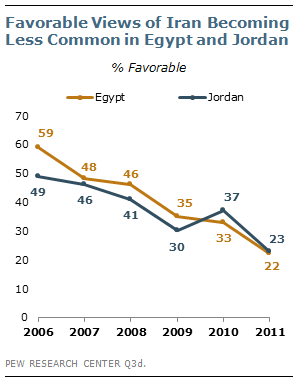 Moreover, ratings for Ahmadinejad have fallen significantly since last year in Egypt and Jordan. Nearly three-in-ten Egyptians (28%) expressed confidence in him last year, compared with just 18% today. Among Jordanians, confidence in Ahmadinejad declined from 32% to 23%. As is the case with overall ratings for Iran, public opinion in Lebanon about Ahmadinejad remains divided along sectarian and religious lines. Nearly nine-in-ten (86%) Shia Muslims have confidence in the Iranian president, compared with only 18% of Christians and just 9% of Sunnis. Ahmadinejad receives his most favorable reviews in Indonesia and Pakistan, where on balance, he gets positive ratings. Roughly half of Indonesians (48%) have a lot or some confidence in him, while 28% lack confidence. In Pakistan, 40% express confidence; 16% lack confidence; and fully 44% offer no opinion. Israelis give the Iranian president his worst ratings – overall, 95% of Israelis say they have not too much or no confidence that Ahmadinejad will do the right thing in world affairs. This view is shared by 73% of Israeli Arabs. In nearly every predominantly Muslim country polled there is widespread opposition to Iran acquiring nuclear weapons. More than six-in-ten Lebanese (64%), Egyptians (63%) and Turks (65%) oppose the idea of a nuclear-armed Iran. Only in Pakistan does a majority of respondents (61%) support Iran’s nuclear ambitions. Lebanese public opinion once again reflects wide sectarian and religious differences. Support for Iran’s nuclear program stands at 78% among the Shia community, compared with just 23% of Christians and 6% of Sunnis. Fully 93% of Israelis oppose Iran acquiring nuclear weapons. Among the country’s Arab community, 58% oppose this idea, while 25% favor a nuclear-armed Iran and 17% give no opinion.